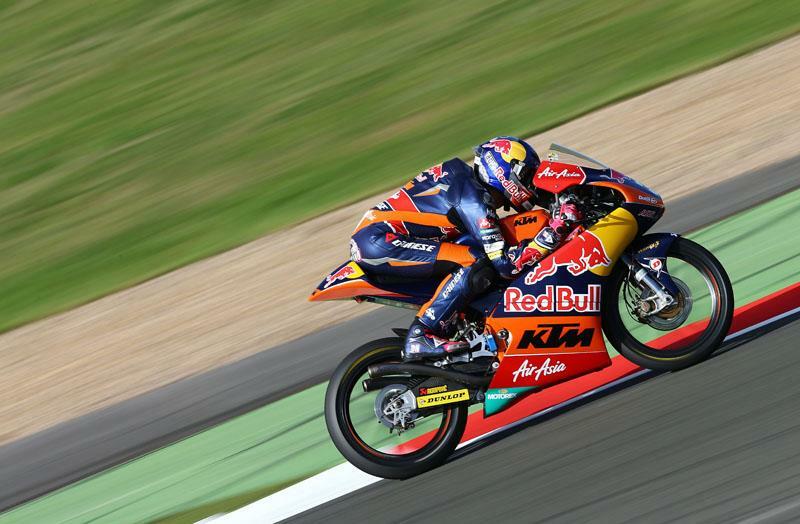 Luis Salom has taken an epic win in the Moto3 race at Silverstone, after a four-way battle that lasted from the lights went out to the chequered flag. With the lead swapping on almost every lap, any one of Salom, Maverick Vinales, Alex Rins and Alex Marquez looked like they could win it going into the final lap. However, Salom, who managed to take the lead on lap fifteen, was able to pull out a small lead that was just enough to take him to the line. Rins was second, after a last last scrap with teammate Marquez, with Vinales relegated to fourth. Fifth place was no easier, with another four way fight that Miguel Olivera emerged top of, beating Jonas Folger, Jack Miller and Alex Masbou. John McPhee had a strong race at his home round to finish in 14th, adding to his 2013 points total.